'Diwali', also called Deepavali or festival of ligths, is the abstraction of the Sanskrit word Deepavali - 'Deep' means diya (small pots made from clay) or light and 'Avali', means a row - meaning a row of diyas or array of lamps. Thus placing small diyas, candles & lamps inside and around the home marks the festival of lights. It is traditionally known as the "festival of lights", for the common practice is to light small oil lamps (called diyas) and place them around the home, in courtyards, gardens, verandahs, on the walls built around the home and also on the roof tops. In cities, especially, candles are substituted for diyas; and among the riches, candles are made to substitute for fashionable and classy neon lights. The celebration of the festival is customarily accompanied by the exchange of sweets and the explosion of fireworks. Diwali is an occasion for cheerfulness and togetherness. This is an occasion for young and the old, men and women, rich and poor - for everyone to celebrate. Irrespective of their religious and economic background, the festival is celebrated throughout the country to ward off the darkness and welcome light into life as light is always associated with hope for the future Diwali is celebrated 20 days after Dussera, on Amavasya - the 15th day of the dark fortnight of the Hindu month of Ashwin (Aasho) (Oct/ Nov) every year. While Diwali is popularly known as the "festival of lights", the most significant spiritual meaning is "the awareness of the inner light". Central to Hindu philosophy is the assertion that there is something beyond the physical body and mind which is pure, infinite, and eternal, called the Atman. Just as we celebrate the birth of our physical being, Dipavali is the celebration of this inner light, in particular the knowing of which outshines all darkness (removes all obstacles and dispels all ignorance), awakening the individual to one's true nature, not as the body, but as the unchanging, infinite, immanent and transcendent reality. With the realization of the Atman comes universal compassion, love, and the awareness of the oneness of all things (higher knowledge). This brings Ananda (inner joy or peace). Diwali celebrates this through festive fireworks, lights, flowers, sharing of sweets, and worship. While the story behind Dipavali varies from region to region, the essence is the same - to rejoice in the inner light (Atman) or the underlying reality of all things (Brahman). The First day is called Dhanteras or Dhantryaodashi, which falls on the thirteenth day of the month of Ashwin. The word "Dhan" means wealth. This day has great importance for rich community. It is believed that sixteen year old son of King Hima according to his horoscope was doomed to die on the fourth day of his marriage by a snake-bite .So, on that particular fourth day of his marriage his worried wife lighted innumerable lamps all over the place and laid all the ornaments and lots of gold and silver coins in a big heap at the entrance of her husband's boudoir. And she went on telling stories and singing songs through the night. When Yam-the god of death arrived there in the guise of a Serpent the dazzle of those brilliant lights blinded his eyes and he could not enter the Prince's chamber. So he climbed on the heap of the ornaments and coins and sat their whole night listening to the melodious songs. In the morning he quietly went away. Thus the wife saved her husband and since then this day of Dhanteras came to be known as the day of "Yamadeepdaan" and lamps are kept burning throughout the night in reverential adoration to Yam, the god of Death. On the first evening of Diwali, many Hindus light a single lamp, a diya, and place in front of the house. The first day is of great importance to the rich community of India Houses and Business premises are renovated and decorated. Entrances are made colorful with lovely traditional motifs of Rangoli designs to welcome Lakshmi, the Goddess of wealth and prosperity. To indicate her long-awaited arrival, small footprints are drawn with rice flour and vermilion powder all over the houses. Lamps are kept burning all through the nights. Believing this day to be auspicious women purchase some gold or silver or at least one or two new utensils. The Second day is called Narka-Chaturdashi or Chhoti Diwali that falls on the fourteenth day of the month of Ashwin. The legend related to this day is about the King Bali of the nether world that mighty power had become a threat to the gods. In order to curb his powers Lord Vishnu in the guise of a small boy visited him and begged him to give him only that much land which he could cover with his three steps. Known for his philanthropy King Bali proudly granted him his wish. So with his first step Lord Vishnu covered the entire heaven and with the second steps the earth and asked Bali where to keep his third step. Bali offered his head and putting his foot on his head Vishnu pushed him down to the underworld. But for his generosity Lord Vishnu allowed him to return to earth once a year to light millions of lamps to dispel the darkness and ignorance and spread the radiance of love and wisdom. This is a day when Hindus arise earlier than usual. The men, especially, will rub their bodies with perfumed oils before bathing. Afterwards, clean clothes are worn; some people wear new ones. In the morning and in the evening, mixes of bright and loud fireworks are set off in an atmosphere of joyful fun and noise. Houses are lit with oil lamps in evening. This creates an enchanting magical atmosphere. The Third day of the festival of Diwali is the most important day of Lakshmi-Puja, which is entirely devoted to the propitiation of Goddess Lakshmi. This day is also known by the name of "Chopada-Puja". The day of Lakshmi-Puja falls on the dark night of Amavasya. Lakshmi represents good fortune, wealth and beauty. Hindus invite the goddess to enter their homes and bless them with good health, happiness and good fortune. Diyas are lit to welcome the goddess into the homes and lives of the worshippers. Even poor people who cannot afford the oil to light too many diyas will make sure that at least a single diya is lit so that Lakshmi may bless them. 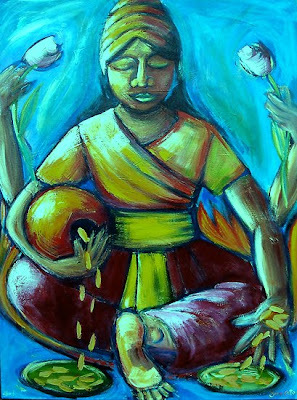 Pictures of Lakshmi show her either standing or sitting on a Lotus flower. Another way of welcoming the goddess Lakshmi into people's homes is by drawing Rangoli patterns on the floor of the entrance of each house. A Rangoli is a sign of welcome. Some Hindus draw one daily as a way of welcoming guests. On the day of Diwali, the whole house is lighted with oil lamps. In addition to the lighting the façade and the sides of the house, one lamp is always placed in areas which are dark. For Hindus who are in business and trade, the settling of accounts marks this day. This is another reason why the goddess Lakshmi is so important during this festival. She is worshipped in the hope that in the new 'Financial year' of trading, she will bring prosperity. Birth of Lakshmi: According to the Puranas, the goddess of Wealth, Prosperity and Luck Lakshmi was born from the churning of the Milk Ocean, along with other magical beings and objects including Amrita, Kamadhenu, Chintamani, Halahal and others. The Fourth day is called Padwa or Varsha Pratipada that marks the coronation of King Vikramaditya and Vikaram-Samvat was started from this Padwa day. Govardhan-Puja is also performed in the North on this day. As per Vishnu-Puran, the people of Gokul used to celebrate a festival in honour of Lord Indra and worshipped him after the end of every monsoon season. 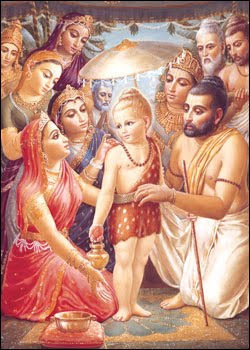 But one particular year the young Krishna stopped them from offering prayers to Lord Indra who in terrific anger sent a deluge to submerge Gokul. 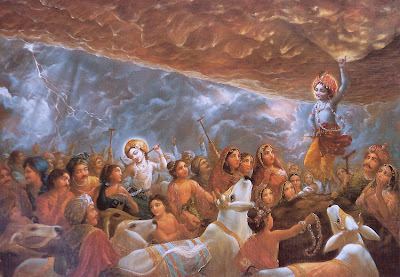 But Krishna saved his Gokul by lifting up the Govardhan Mountain and holding it over the people as an umbrella. This day is also observed as Annakoot meaning mountain of food. In temples especially in Mathura and Nathadwara, the deities are given milkbath, dressed in shining attires with ornaments of dazzling diamonds, pearls, rubies and other precious stones. After the prayers and traditional worship innumerable varieties of delicious sweets are offered to the deities as "Bhog" and then the devotees approach and take Prasad. Goddess Lakshmi is worshipped in every Hindu household. In many Hindu homes it is a custom for the wife to put the red tilak on the forehead of her husband, garland him and do his "Aarathi" with a prayer for his long life. In appreciation of all the tender care that the wife showers on him, the husband gives her a costly gift. This Gudi Padwa is symbolic of love and devotion between the wife and husband. On this day newly married daughters with their husbands are invited for special meals and given presents. Diwali celebration is a very happy occasion for all. The Fifth and final day of Diwali Festival is known by the name of "Bhaiya-Dooj" This day is observed as a symbol of love between sisters and brothers. It is believed that on this day Yamraj -the god of death visited his sister Yami and she put the auspicious till on his forehead, they ate talked and enjoyed together and exchanged special gifts as a token of their love for each other and Yamraj announced that anyone who receives tilak from his sister on this day will never be thrown. Since then it became imperative for the brother to go to his sister's house to celebrate Bhaiya Dooj. The Defeat of Narkasur by Lord Krishna: Lord Vishnu in his 8th incarnation as Krishna destroyed the demon Narkasura, who was causing great unhappiness amongst the people of the world. Narkasura was believed to be a demon of filth, covered in dirt. He used to kidnap beautiful young women and force them to live with him. Eventually, their cries for rescue were heard by Vishnu, who came in the form of Krishna . First, Krishna had to fight with a five-headed monster who guarded the demon's home. Narkasura hoped that his death might bring joy to others. Krishna granted his request and the women were freed. For Hindus, this story is a reminder that good can still come out of evil. 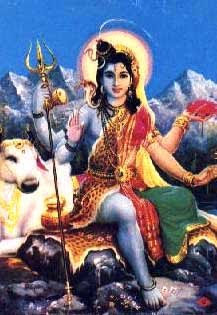 Austerities of Shakti: According to the Skanda Purana, the goddess Shakti observed 21 days of austerity starting from ashtami of shukla paksha (eighth day of the waxing period of moon) to get half of the body of Shiva. This vrata (austerity) is known as kedhara vrata. Deepavali is the completion day of this austerity. This is the day Lord Shiva accepted Shakti into the left half of the form and appeared as Ardhanarishvara. The ardent devotees observe this 21 days vrata by making a kalasha with 21 threads on it and 21 types of offerings for 35 days. The final day is celebrated as kedhara gauri vrata. It is believed that goddess Parvati played dice with her husband, Lord Shiv on this day and she decreed that whosoever gambled on Diwali night would prosper throughout the ensuring year.This tradition of playing cards- flash and rummy with stakes on this particular day continues even to day. According to the Vedic culture, the message of Tamaso ma jyotir gamaya (from darkness unto light) is given through the festival of Deepawali to all peoples of the world. During the night of Deepawali the myriads of little clay lamps (dias) seem to silently send forth Deepawali messages: Come let us remove darkness from the face of the earth. This is not the work to be done by one dia or by one individual. It requires collective effort. In the diffusion of light the question of high and low is forgotten. This is the lesson taught by both small and big dias. The second message of the burning dias is to destroy the difference between rich and poor- the destruction of discrimination based on poverty and wealth. The burning dia, whether in a palatial bungalow or in a grass hut, is a symbol of this unity. The wall of separation based on economic status cannot prevent the penetration and spread of the light of the dia. The third message of the burning diias of Deepawali is to kindle the extinguished lights of our neighbours. Let us find out what is needed- whether there is a shortage of wick or oil- and just by a little help the neighbour’s lamps can be lit. One dia can light several others. A little charity can bring joy to countless others. The row of lamps teach yet another lesson and that is of unity as exemplified in Satyam, Shivam Sundaram- Truth, Joy and Beauty. The lights of Deepavali are displayed at the entrance doors, by the walls of houses, in the streets and lanes. This means that the inner spiritual light of the individual must be reflected outside. Passersby may thereby be prevented from stumbling on their way to reach their destination. The lights of the dias on earth beckon the lights in the firmaments to descend upon earth and establish the heavenly kingdom of God for the welfare of the human race. Feeding empty stomachs, lighting blown-out dias and providing cheer and joy amongst the downtrodden is to enter the true spirit of Deepavali. This is the true prayer to Lakshmi Devi.